Belavia is the national airline company of Belarus. It was founded 1996 and is state-owned. Belarus is a beautiful country with a fantastic nature. After spending a week in Minsk, the capital of Belarus it was time to fly home. The flight would leave at nine from the international airport Minsk 2. It is located 40km from the capital Minsk. The check-in and security check went fast and I had plenty of time before boarding. The airport has been restored and got a new tax-free shop. I was welcomed by the cabin crew during boarding. Todays crew: one young man and one young women. Belarusian newspapers and caramels to eat on during take-off/landing are offered. The boarding was completed and we could taxii out for departure. Estimated flight time: 1h 40 min. 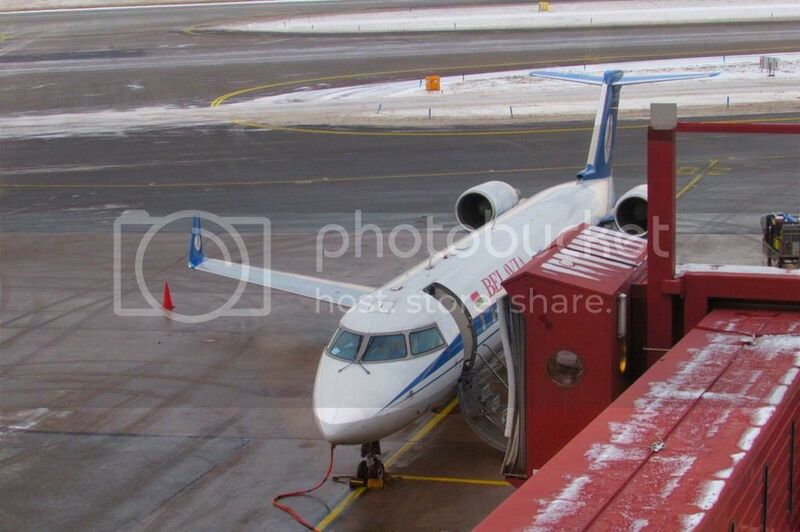 The aircraft was a Canadair CRJ200 with the registration EW-276PJ and has been with Belavia since 2009. It has flown with SkyWest Airlines and Atlantic Southeast Airlines. The cabin was very clean. It was much nicer then the old AN-24, YAK40 and TU-134 which have been flying from Minsk to Arlanda. We took of at 9.25 after the de-ice. The weather was nice and sunny. There was no wi-fi on the aircraft. The service started after the take-off. Coffe/Tea, water and chocolate (20g) was served but you could not buy anything else. Few years earlier you was served hot meals and soft drinks but it was later changed. Very nice and kind crew. We started our descent into Stockholm Arlanda after 1h and 30min and we make a soft touchdown on runway 19R. It was a very nice flight and I would love to fly with Belavia again. Tillbaka till "Belavia Economy Class Bombardier CRJ"